I love old photographs. Over the past few years I have scanned and made digital backups of our old family photographs. 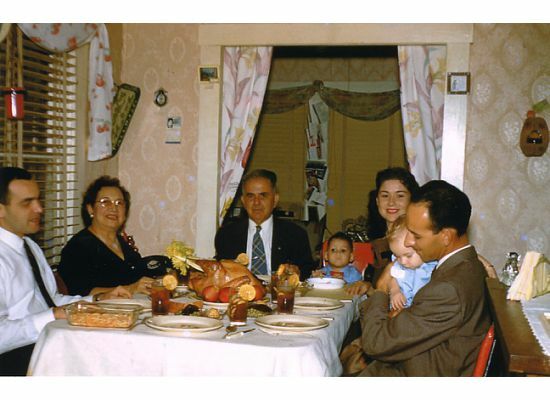 One of my favorites is a photo taken at my grandparents home on Thanksgiving Day in 1958. I am seated next to my grandfather and my Dad is holding my sister Bonnie while Mom looks on. This is one of those photos that stirs up a lot of great memories and reminds me of how fortunate I am to have enjoyed such a happy childhood. That’s not something I take for granted, especially in light of all of the painful family stories others have shared with me over the past thirty-three years in ministry. I realize more than ever that one of the greatest gifts my parents gave me was a secure home that was filled with love and affirmation. That’s why my heart is filled with gratitude when I look at this particular photo. It reminds me to give thanks for the blessing of family. My wife Cheryl and her sister Cindy were also blessed with a great childhood. Cindy and Cheryl were both adopted within eight months of each other by a loving couple who gave them a wonderful home they otherwise might not have had. Cheryl’s extended family is much larger than mine so there were always lots of arms to embrace her and Cindy at family gatherings. These baby girls were raised in a home where they enjoyed a lifetime of love expressed not only on special holidays but on the ordinary everydays. Today, Cheryl and I will host Thanksgiving dinner at our home surrounded by people we love. That is cause for giving thanks. Today, my thoughts have also turned to several friends who never experienced the kind of love and support that I had while growing up. What I admire most about these friends is how they have taken intentional steps to give their kids a love-filled home. They remind me that while we can never go back and make a new start we can always start to make a new end. And because of their determination to give what they never received while growing up, their own kids will one day look back on childhood days and feel a profound sense of gratitude. And, perhaps they will look at old family photos and come across a particular favorite that causes them to remember the warmth of hearth and home. Happy Thanksgiving to you and your family. Make it a day worth remembering. Thanks, Shoby. Have a great weekend.